The week started off with a bang, as Vettel-gate drew the anger of many a RBNY fan (including myself). If you don't know what I'm talking about, our own Matt Conroy (aka Who Shot Sam) was all over this one, this past Monday. Also, KCKRS and Empire of Soccer were all over this one as well. The Red Bulls will host a 1st round US Open Cup match on Tuesday, June 28th (8:00pm). Their opponent will be either FC New York (USL Pro League) or NY Pancyprian Freedoms (USASA). The Copa America 2011 will be played later on this Summer, and the Red Bulls (once again) stand to lose some players to International duty. One player that the Red Bulls will, apparently, not lose to the South American tournament is left back Roy Miller. Now, is that a good thing or not? I haven't quite decided yet. Thierry Henry and Greg Sutton were up for Goal of The Week and Save of The Week (respectively). Henry's game winning strike, against New England, didn't have a chance, as he was up against this insane bomb of a goal, but Sutton took top honors in his category. In attendance last weekend, @The Cathedral of Football, was none other than former Croatian International, Real Madrid & Arsenal forward Davor Suker. The legendary scoring ace had some nice things to say about his RBA experience. "About that crown jewel: Red Bull Arena is everything you've heard: It's beautiful. It's loud. It's ultra-modern. It's busy. It's close to the metro. It's a great place to watch a soccer game. Did I mention that it's loud? I can honestly say, as much as it pains me, that it was the first time I've been to a Major League Soccer game that felt major league." Wow! That's as glowing a review as I've seen, since The Cathedral of Football opened last year. RBNY midfielder Mehdi Ballouchy, and several other MLS players, visited St. Jude’s Children’s Research Hospital in Memphis, TN as part of MLS' Soccer Kicks Cancer initiative. Red Bull Arena sits on top of Sports Illustrated's MLS Stadium Power Rankings. No surprise there. The newest RBNY Supporter's Group, Viking Army, have a very nice new website. Check it out, as it's Backe approved! Red Bulls rookie Matt Kassel, apparently, has a blog on NJ.com. He joins fellow Red Bull Tim Ream in the blogosphere. If you haven't done so already, please check out Daily Harrison for great Red Bulls coverage. They also frequently have great Red Bulls photo galleries, like this one (from the New England game) and this one (featuring the South Ward). They also let us use their pics for out posts. 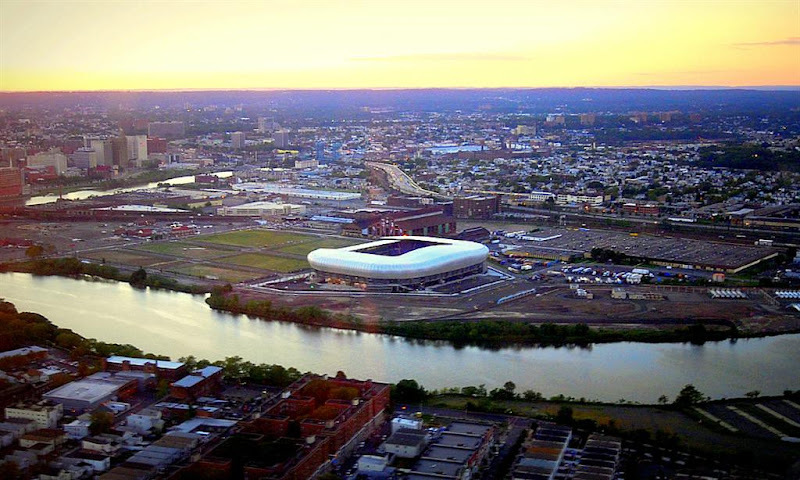 Check out the large version of the above aerial view of RBA by clicking here. The great Mark Fishkin, of Seeing Red fame, was featured (along with his son Max) in this MLS father-son story. Individual tickets for the MLS All-Star game are sold out. NBA Superstar Steve Nash will, once again, bring his Showdown In Chinatown charity football match to NYC. Finally: I found this article, regarding the second division Rochester Rhinos, supremely interesting. There's lots of behind the scenes MLS stuff and even some promotion/relegation talk. Check it out! That's all for now, Viper Out!